The music industry can be pretty impenetrable, even if you just want to share your songs and recordings with the world. DIY is all very well but where to start? Is it affordable? What matters most? Here’s a summary of the main points for beginners. When you’re ready check out the full story in Music business and DIY. This page is the overview. The DIY checklist goes through the process in more detail, step by step. There’s no reason why you can’t make and sell original recordings. You don’t need to ask permission, pay anyone, join anything or fill in a form. Proper CDs cost about £1 each for the minimum order of around 1,000. You should get a free MCPS license for pressing (to make sure you aren’t infringing). Burned CDs cost less, you can order small runs or do it yourself but they won’t be so good either way. You don’t always need a license. You can get blanks pre-printed in bulk or print them yourself on a decent inkjet if you don’t need so many. You can make downloads available very cheaply. Download aggregators can feed your tracks to over 50 retail sites for a small commission. It goes without saying people won’t buy your stuff unless they want it. To want it they have to hear it. To buy it they have to find it. Free web space has limitations. It’s better to run your own site for about £5 a month (like this one). A dot com name costs about £10 a year—other names cost less. There are many other ways of getting online without building or running your own site. Most people today would use something like Bandcamp or SoundCloud. You can take credit card payments from your own site or use a third party music retail site to sell CDs and merchandise, and distribute downloads. Specialist music sites and download aggregators are easy to use alongside your own site. You only need to sell direct from your own site if you want to do something unusual. If your music gets exposure on radio, TV, online or in venues you might earn royalties. If you join PPL you are the record label and if you join PRS you are the publisher. There’s no need to join a royalty collection society before you have commercial material ready. As a record label you should join PPL (it’s free) and notify your recordings before they’re played by big media or venues. 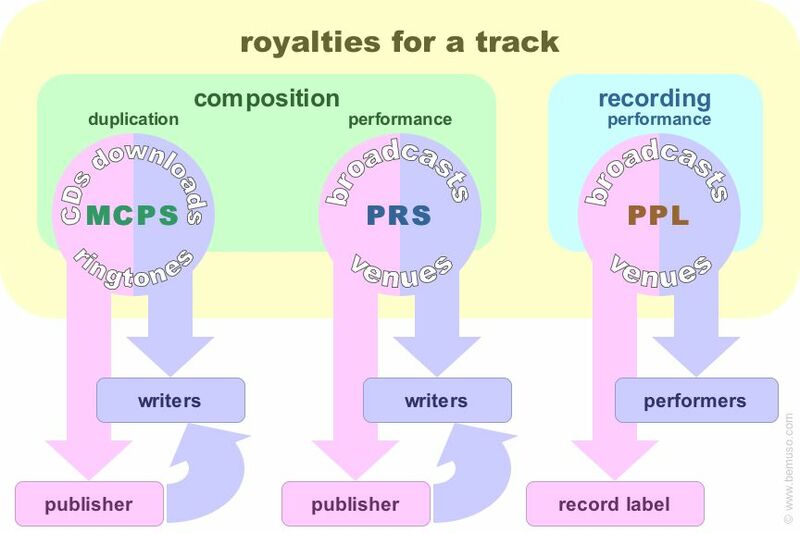 MCPS and PRS keep back-royalties for writers and PPL keep them for performers, so there’s no immediate problem as long as you’re credited properly when the recording is released. PRS is now very cheap to join (£10) and if you’re gigging your material regularly it’s worth claiming your royalties from pubs and clubs. Note the addresses, post codes and your setlists (see PRS for details). You will not get a normal distribution for these royalties unless you claim. You should claim MCPS or PRS as soon as possible but they are notoriously slow, so let them know as soon as you can and chase them up regularly (by phone if they make mistakes, not email). When you create lyrics or music in any tangible form they’re copyright. You don’t need to ask permission, pay anyone, join anything or fill in a form. Your written compositions and recordings are copyright. So “how do I copyright my song?”—record it, write it down or video it. You need to keep some evidence copyrights are yours and when they were made. Online copyright sites don’t have special legal status, they just store your files. Some people worry about releasing their music on the Internet but sooner or later it will be vulnerable anyway. Streamed audio can be copied, and once a CD is out of your hands it can be copied. Keeping it under wraps just delays the inevitable. You can trademark your names but it’s expensive—you may need several trade categories in more than one country. Don’t expect exclusive ownership either way. Band name registers don’t have special legal status, they are just catalogues of names. As long as you can justify your web site names, ownership is simply a matter of buying them from a registrar. The best way to claim ownership of a copyright (or other intellectual property right) is to use it as early and publicly as possible. A DIY operation can sometimes benefit from third party services. You probably don’t need a publisher to collect royalties (unless you have earnings abroad) but they can help get your compositions used commercially. And although you can distribute your own CDs and downloads a professional distributor or aggregator is better for higher volumes. There are many ways to get music to your audience. CDs are still the popular consumer choice. Podcasting, Twitter and Facebook are fashionable online, but there’s also Internet radio and download communities. Offline digital media like satellite and other new channels are growing rapidly. Technology fads come and go (multimedia, podcasts, blogs, wikis, etc.) if you miss one there’ll be another along in a minute. Sort out a sensible direction for the next year or so, using proven technology that does what you need. There is more about getting started with web music tools here. Don’t chase the latest hype—use the media your audience uses. There are lots of middlemen (promotion, marketing, etc.) online. Be sceptical. Their business is about making themselves money. Nobody has a secret recipe. If a middleman pitches you personally to venues, distributors, media, etc. fine, otherwise you’re just another name on a mailing list. Judge by results. If you make a profit you should declare it for tax but you don’t need to form a company beforehand, and you don’t need to set up a company to run a label. If you make commitments with other people (e.g. a band or a manager) you should formalise them in writing. Plain English will do to start with if you can’t afford a lawyer. The important thing is to cover your risks. If you think you have tax to pay put it in a savings account until you’re sure. If you make a profit tell the tax man sooner rather than later. The Inland Revenue may decide you are trading even before you make a profit. If in doubt ask HMRC but be aware their call-centre isn’t always right, so check before jumping through hoops. Business Link is a government guide to all the red tape for running a business. In the early days less is more, whether it’s memberships, society agreements, distribution or artist contracts. Loose commitments are better to start with. If you have options on geographic coverage, contract length, scope, etc. sign for as little as possible today. Labels, managers, publishers, etc. want to buy you cheap for as long as possible. You might get better terms or make different choices a year from now. Professional organisations are most effective. Organisations for amateurs like ISA, GISC, SWG, etc. are cheaper to join but don’t support professional members. AIM, BASCA and the MU may be relevant for DIYers, with useful seminars and resources. MMF is less useful to join (unless you’re a manager) but also provides good background material and support. Get broadband and get online if you aren’t already. talk to local musicians, writers and music business people. making money or breaking even. Get to know the current position with DIY music resources on the web. There’s a more detailed guide in the DIY checklist but how you promote your work must be personal and distinctive. It can get complicated so keep organised and don’t try to do everything at once. Be persistent. Make a simple written plan for the next few months. Re-plan when your planned activities are complete. Good luck.